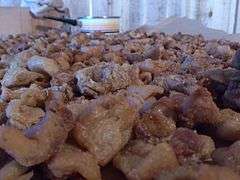 Čvarci (singular Čvarak) (Serbian Cyrillic: Чварци / Чварак) is a specialty popular in the Balkan cuisine, a variant of pork rinds. 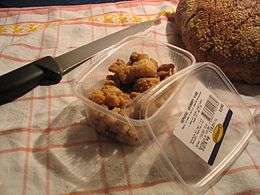 They are a kind of pork 'crisps', with fat thermally extracted from the lard. 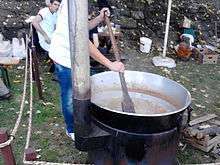 Čvarci are mostly a rustic countryside specialty, common to Serbia, Bosnia and Herzegovina and continental Croatia, though they can also be found in some other countries of Southeastern Europe. They are usually homemade, with industrial production not as pronounced. In larger cities they can be obtained on farmer markets or in supermarkets. 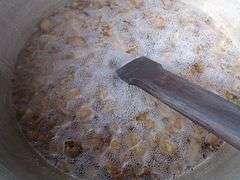 Preparation of čvarci involves melting the lard. Lard is cut in blocks of about one inch (2 cm) in size and slowly fried in their own fat. Milk may be added at this point in order to obtan caramel colour. Process lasts until all fat melts away and only a kind of tough crispy pork rind remains. Onion or garlic may be added as a spice and salt is always used as condiment. Pieces of skin may or may not be attached. In most common varieties of čvarci, some percentage of pork fat remains. A special variety of čvarci, known as Duvan Čvarci are produced in the Šumadija region of central Serbia and especially around the town of Užice. In case of duvan čvarci, the process of slow fat frying/cooking is prolonged until completely all fat is extracted. The remainder is a mass of delicate fibers which resembles finely chopped tobacco, thus giving the name to the variety: 'Duvan' is a Serbian word for tobacco. Indications for 'Duvan čvarci' had been registered and protected in the Serbian intellectual property office by Slavoljub Batoćanin. A similar process is used to the same effect in Hrvatsko Zagorje, where čvarci are pressed in a potato press to achieve better fat extraction. As with most traditional pork products, they are considered to be winter food. Traditional time for pork processing in the Balkans is late autumn, and čvarci are consumed throughout the winter. They can be eaten on their own as a snack, combined with heated fruit brandy common to the same region, called rakija, or they can be used as an ingredient in other food recipes. In Croatia, they are most often eaten with bread and onions. If consumed as a snack, they are very often combined with beer. Recipes with čvarci include various sorts of pastry. Wikimedia Commons has media related to Čvarci.